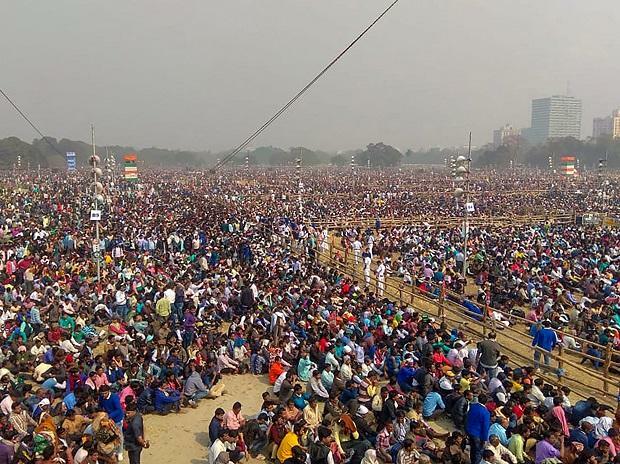 Marking a show of India’s biggest ever Opposition unity in the recent past, 23 dominant regional parties including the Congress, sans Sonia and Rahul Gandhi, converged in Kolkata on Saturday, at Mamata Banerjee’s behest, in the historic Brigade Parade Ground. The sole objective was to oust the incumbent Modi government in the forthcoming general elections this year. Leaders like H D Deve Gowda, former prime minister and leader of Janata Dal Secular; Sharad Pawar, former chief minister of Maharashtra and president of the Nationalist Congress Party; Arvind Kejriwal, chief minister of Delhi and leader of the Aam Aadmi Party; H D Kumaraswamy, Karnataka’s chief minister and leader of Janata Dal Secular, Chandrababu Naidu, chief minister of Andhra Pradesh and leader of Telugu Desam Party, Akhilesh Yadav, former chief minister of Uttar Pradesh and president of the Samajwadi Party, Farooq Abdullah and his son, Omar Abdullah, both former chief minister of Jammu and Kashmir and leaders of the J&K National Conference, M K Stalin, president of the DMK, besides several other leaders, shared the dais with West Bengal’s Chief Minister and Trinamool Congress supremo Mamata Banerjee. Although Congress leaders – Sonia Gandhi and Rahul Gandhi – abstained from the mega rally, which saw a convergence of 4 million people, the party was represented by Mallikarjun Kharge, Congress’ leader in the Lok Sabha and party spokesperson Abhishek Manu Singhvi. However, Sonia sent her message conveyed by Kharge. It read, “The upcoming Lok Sabha elections will not be an ordinary one. This will be the election to restore faith in democracy and to defeat the forces trying to sabotage the Constitution of India. This rally marks an important attempt to galvanise leaders”. Other parties who sent key leaders were Bahujan Samaj Party, Rashtriya Janata Dal (represented by Tejashwi Prasad Yadav), Rashtriya Lok Dal, Gorkha Jan Mukti Morcha (with whom the West Bengal government fought a bitter struggle last year), Gorkhaland National Liberation Front and others. The message each of these leaders and parties dissipated was their readiness to share seats with the Opposition allies to dethrone the Modi government in the upcoming elections. Although any formal alliance of the major opposition parties is yet to be formed, this rally marked the beginning of such motive with leaders pledging to confront the BJP with a united opposition of local parties. “It is a rainbow of 22 parties which is getting built”, Singhvi said. He accused the Modi government as a government of vendetta and vengeance which is breaking the unity of India on lines of religion, caste and creed. Sharing a similar belief, Ke alleged, “Since the past 70 years, Pakistan had been trying to break Indian unity. What they couldn’t achieve in 70 years, Modi and Amit Shah has done it in a matter of less than five years”. He was referring to various instances of mod lynching, enactment of the Citizen Amendment Bill and the current economic condition. Pawar took a dig at PM Modi alleging that the government has been destroying crucial democratic institutions like the CBI, ED, RBI, Income Tax department and providing false information to the Supreme Court on various instances. All of the leaders unanimously agreed that such institutions need to work independently for the proper functioning of a democracy and the government needs to keep its hands off to ensure its proper functioning. Banerjee termed Modi’s governance as a Fascist rule which has crossed the Laxman Rekha in politics (political ethos and mutual respect) and alleged schemes in the insurance sector, banks and the Rafale deal as big scandals waiting to be unearthed. “Off guard, the union finance minister had said that no matter how much money you keep in banks, you cannot withdraw more than Rs 1 lakh”, she claimed adding, “If they are re-elected to power, the common people will suffer the most”. “Whenever and wherever the BJP does a meeting, do a counter-meeting the very next day and counter their propaganda. BJP’s end starts here from today, from this very rally”, she asked the leaders and her supporters. Ethical standards of the BJP were also questioned with Kumaraswamy alleging the BJP resorting to horse-trading and lure Karnataka assembly members with money. “If you misbehave with Karnataka, you are going to pay a heavy price”, Naidu warned the BJP in the rally. Major leaders asked the people to view the coming election as “India’s second war of independence” and unsettle the incumbent BJP government at the Centre to re-install people’s faith in the country’s constitutional framework, its democratic institutions, the laws of the land and diverse customs. Leaders from the north-east, including former chief minister of Arunachal Pradesh Gegong Apang, who resigned from the BJP recently, warned the BJP of restraining from interfering with personal lives including dictates on what to eat and not to eat, respect local customs and traditions and restrain itself from enacting the Citizenship Amendment Bill into an Act or face consequences. Rebel BJP leaders, who once adorned the Vajpayee government alleged Modi to be autocratic and hurt the Indian growth story by demonetization and a half-baked GST. Deve Gowda, however, appealed to the political leaders of forming a core committee to decide quickly on the election manifesto and conclude seat-sharing agreements. The face of the prime ministerial candidate has not been agreed upon and will be decided after the elections. The next such mega rally has been planned in Amaravati in Andhra Pradesh and in Delhi in the coming days. At a separate event in Gurajat, Modi, referring to this mega rally, said that this opposition front is not against just him but against India and even before the opposition alliance has been formed, these parties are arguing among themselves over seats. Former finance minister and BJP leader Yashwant Sinha: Even though I have left the BJP, I know how they will respond to this rally. They will say that this gathering was to dethrone one man, the Prime Minister. But I want to tell you that this is not about one individual, this is about an ideology. We are against that ideology and we are together against it today. Abhishek Singhvi, senior Congress leader and Rajya Sabha MP: This is a rainbow of 22 parties... ideologies, languages are different, but it's one rainbow. Clouds are fading, and a rainbow of different parties is emerging. Former PM and Janata Dal Secular chief HD Deve Gowda: What is our policy and programme, how we are going to come together is the question? Forget differences, come together otherwise it's not so easy. I appeal to all leaders, come together... a small group of experts should come together to form a manifesto. M K Stalin, president, DMK: Modi and Amit Shah are afraid of some people but it Didi (Mamata Banerjee) who are they afraid of the most. They are afraid to come to West Bengal.